Below are the photos of 2 fillies that FCER pulled out of a slaughter feedlot, while working in conjunction with two other rescue organizations. Both fillies are sick, and currently receiving vet care. The pretty palomino will be continuing her journey to Arizona and New Hope PMU Equine Rescue when she is recovered. 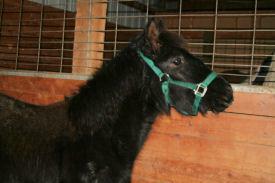 The black filly, a Percheron/TB cross, will be staying on at FCER. She will be available for adoption when she has completed rehabilitation. A special Thanks goes out to Amber, at Shiloh Acres. Amber goes to the feedlot weekly and pulls out the horses she can. She's a very courageous lady. Update - April 2008 Pandora, the black Percheron/TB cross has found a wonderful home with one of our volunteers, Nicole! She is adjusting nicely, and Nicole loves her dearly. The palomino filly, Reign, has left FCER to continue her journey to New Hope Equine Rescue in Star Valley, Arizona. NHER will find Reign her forever home. Congratulations to one and all on saving these two beautiful fillies from slaughter! out of abuse and neglect any more than we can slaughter our way out of it."